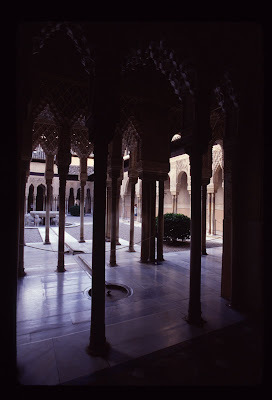 Many years ago, I wrote a short story about an adventure I had in La Alhambra, Granada's Moorish fortress, one of the most unique, wonderful and emblematic cultural monuments on the planet. The experience occurred in the early 1970s during the eight years I lived in Andalucía, when I had the good luck to visit Granada at least a half dozen times (and have been there a few times since, including on Oct. 17, 2013). I put the story aside, along with a story--Spanish Spirits to Warm Your Soul at the Gran Café 'El Suizo' in Granada--that I did two decades ago about drinking Jerez brandy in Granada on a cold February night in the superb old Gran Café Granada, popularly known as ‘El Suizo' (now, lamentably closed). The formally attired waiters at El Suizo warmed large brandy snifters with hot water, ritually dried them with a white napkin, then poured a Gran Duque de Alba or Cardenal Mendoza or Lepanto, whose sweet volatized perfume was enough to warm your soul. With your warm, rich brandy, you felt immediately at peace in that elegant, classic place and you knew you would sit at those marble-topped tables lost in conversation until the yawns of waiters--some of whom had been serving brandy properly for more than two generations--let you know that it was time to go. In late January (2009) in Larchmont, New York, at a private recital organized by my friend Hayes Cavanaugh--a lawyer and accomplished jazz musician who loves Spain--all this came back to me as I was listening to Francisco Tárrega's lovely Recuerdos De La Alhambra guitar piece being played by a consummate young Riojan maestro, Pablo Saínz Villegas, who has a flawless touch as silky and elegant as any guitarist I have ever heard. 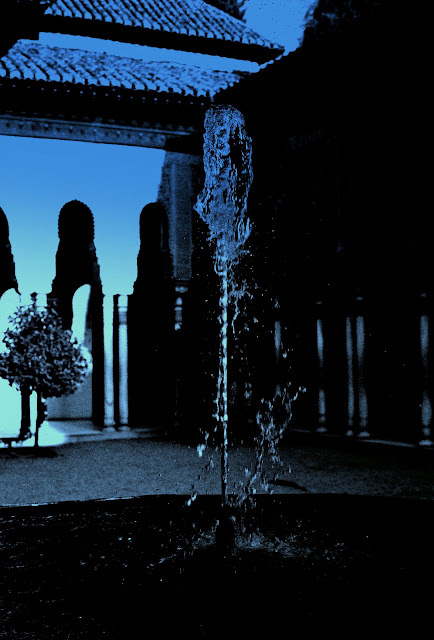 Pablo introduced the piece by saying that the composer had been inspired by the fountains of the Alhambra, whose bubbling waters can be heard tinkling everywhere throughout the lovely gardens and magnificent buildings of this most poetic, evocative and romantic of Spain's incredible collection of historic sites. 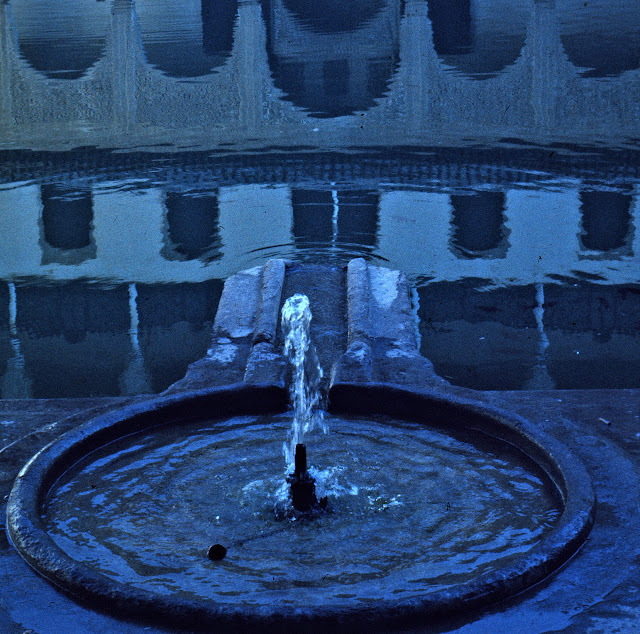 The sound of the water is the legacy of the Nasrid rulers who had to abandon this magical place in the face of the triumphant Christian army of Queen Isabela and King Ferdinand in 1492 following, whose long siege of Granada was conducted from the newly built town of Santa Fe, a few miles away. It is this sound of water--essentially an unbroken stream of natural music--that is a direct link to the last Moorish taifa of Spain that stretches back more than five centuries. 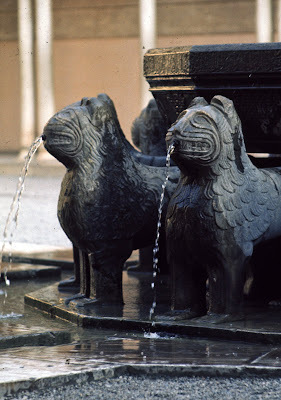 If they returned today with their eyes closed, the sound of the fountains would assure them that they were indeed back home in the Alhambra. Pablo Saínz Villegas's splendid touch with the guitar, seemingly caressing the strings, never strumming them, but stroking them seamlessly, was as magical as the Alhambra. Shortly into his piece I was literally in a trance. Indeed Pablo Saínz himself seemed transported. His music recalled those tinkling fountains and I was transported back to Granada, literally seeing the places I had been, smelling the flowers in the gardens, recalling the arabesques of the Alhambra's stunningly honeycombed palace halls, seeing the reflecting pools and the fountains flowing, bubbling, tinkling just as the notes were flowing from the string of his gently coaxed guitar. When Pablo finished and I came out of my trance, I told him that he had taken me back to a night of the full moon in the Alhambra which is the basis for the adventure that follows. In the depths of the Alhambra, Robert struck the flint wheel of the Zippo lighter his uncle had given him when he left for his Navy tour-of-duty in Spain. In the lighter's flame, the walls of the old Moorish baths were bathed in a warm glow and the water in the bathing basins reflected the flickering yellow light. With the light, Robert, Julia, and Paul Andrews, a Baltimore doctor touring Spain, momentarily lost the spooky sensations they had been feeling as they stood in darkness, which was pierced only by the filtered light of the full moon as it passed through the glass covering the small eight-pointed star-shaped skylights of the 14th-Century baths. Adding to the escalofriante (spine-tingling) air of being down in this old place in the dark was the fact that what they were doing was totally illegal and they were doing it in a national monument in Generalisimo Franco's Spain. And they were lighting their way just by a cigarette lighter, which quickly got too hot to hold, and was running low on fluid. Robert gingerly flipped the top on the lighter and the light went out. Juggling it in his hands, he laid it on the edge of one of the baths to cool. One of those sections was the suite of rooms occupied by Washington Irving, author of The Sketch Book of Geoffrey Crayon, Gent in which the immortal short stories, "The Legend of Sleepy Hollow" and "Rip Van Winkle" appeared. Irving actually lived and wrote in the Alhambra while he was working on A Chronicle of the Conquest of Granada (a history of the years 1478–1492). Irving was so inspired by the magical beauty of the Alhambra that he wrote Tales of the Alhambra, a book that is still in print in various editions and is sold in gift shops and book stores in the Alhambra and all around Granada. It was a wonderful May night. The sky was clear and there was a full moon. The cool blue-white moonlight washed over the old Nasrid fortress, which takes up a whole ridge above the magical ancient city of Granada. Someone had told Paul Andrews that sometimes you could still hear nightingales singing in the Alhambra on nights of the full moon. "Maybe you will be lucky and hear them," the man had said, "they don't like pollution; it is believed that the exhaust from automobiles is driving them away." They crept quietly, treading Indian-like along the passageways, keeping to the shadows when they spotted a tourist or a guard in the lighted sections across a courtyard, whose fountains still bubbled in the night, splashing and gurgling, making the same sounds they did when this remarkable place was inhabited by the Moors back in the 14th and 15th centuries. Always in these Moorish places, there was water, the most prized liquid in world to the desert-rooted Moor. The Moors built man-made oases into their palaces and the sound of water was an unbroken link to the past, like music from a bygone era. There were the fountains like the one in the Court of the Lions and there were long, deep pools for ornamentation--now with goldfish--and for bathing. The pools were surrounded with hedges and palm trees. This place must have been a paradise on earth for the Moorish ruling class. The sound of footsteps brought Robert out of his momentary fantasy and they saw the glow of a light coming from around the corner at the end of the passageway to the right. Someone, probably a security guard, was coming. "Let's get out of here," Robert motioned. At the top of the stairs was a place that Robert knew. He silently removed the little wooden barrier and they passed back into the legal areas. Robert put his hands in his pockets and they strolled through a filigree doorway and into a lighted, arabesque-adorned hall. A guard appeared and motioned for them to hurry, it was closing time. He ushered them along towards an exit to the public grounds outside. As they rounded the corner of Palacio de Carlos V, a big, square, blocky building that was as incongruous in this graceful place as a sumo wrestler dancing a Swan Lake ballet, a flashlight-toting guard came up behind them. The guard flipped open the lighter, lit a cigarette, inhaled a puff from the black Spanish Ducado cigarette and grinning watched Robert, Julia and Paul disappear into the night.